We are excited each year to be recognized as a Top Lender by Mortgage Executive Magazine, but especially this year, after what our industry endured over the last half of 2013. Rhode Island based residential mortgage lender Embrace Home Loans has once again been recognized on this year’s list of the Top 25 Mortgage Companies in America by Mortgage Executive Magazine. This is the 3rd year the magazine has published the list, with Embrace earning a spot amongst the Top 25 each year. Companies were selected to be featured on this list based on their 2013 total annual dollar volume and total units funded. Mr Noyce was also recently recognized as one of the top 100 Most Influential Mortgage Executives by the magazine. 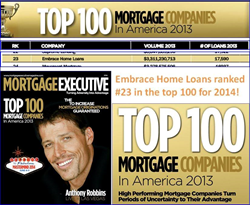 The full list of the Top 100 Mortgage Companies in America featuring Embrace Home Loans appears in the March 2014 issue of Mortgage Executive Magazine. ABOUT Embrace Home Loans - Founded in 1983 and headquartered in Newport, RI, Embrace Home Loans is a direct lender for Fannie Mae and Freddie Mac, approved by FHA and VA, and is an issuer for Ginnie Mae. A member of the Mortgage Bankers Association of America (MBA), Embrace Home Loans is an Equal Housing Lender and an accredited business of the Better Business Bureau. Additionally, Embrace Home Loans has been recognized for its excellence in the workplace and devotion to community service through numerous local and national awards, reflecting the lender’s commitment to its strong values and outstanding service. Embrace Home Loans is a national lender helping hundreds of thousands customers to date. To learn more about Embrace Home Loans visit: http://www.EmbraceHomeLoans.com.